It's been 6 years since Ohlins had released its PCV series. The new model DFV is named after its design; the dual flow valve system. What makes this suspension unit different from any other ones out on the market? We interview Ohlins and have Ikeda the grassroots racer test them out! Ohlins originates from Sweden, starting off as a shock manufacturer for 2 wheel applications. Carrozzeria Japan supports Ohlins in Japan for the research and marketing of their products. Ohlins's newest suspension is the DFV model which features the dual flow valve system (hence the DFV) that controls the attenuation of the moment at the beginning of the shock stroke. "On the compression side of the shock, there is a sub-valve named the PCV in parallel to the main valve. In our new product, we incorporated this PCV valve in the extension side as well, for a dual flow valve design" claims Mr. Funabashi of Carrozzeria. If the PCV was simply incorporated on both the compression and extension cycle sides of the shock absorber, then this simple theory would have been possible 6 years ago when the PCV was first used. But theoretically, with two sub-valves installed in a system, the stroke becomes reduced, hindering the overall efficiency of the shock. This is why it took so long to engineer a super compact design of a unit that has the sub-valve on both sides of the shock. According to Mr. Funabashi, "the shock was ultra smooth against the pavement once the sub-valve was installed." They claim that the success of the new design was proven when the vehicle was tested on a bump. The sub-valve also releases the oil pressure before the piston in the main valve so the shock is easier to begin its movements. With the sub-valve on the compression cycle side, the instant wheel goes over the bump the sub-valve starts to work to absorb the impact resulting in a comfortable ride. However, once the vehicle starts to come off the bump to a flat surface and the sub-valve is not present, it relies on the main valve only. The result of this is that the impact of the wheel rolling off the bump increases. In other words, bad ride quality. This is why it is important to have the sub-valves on both sides of the cycles. Less impact means a comfortable ride. Let's see if our test driver Ikeda will give us some useful feedback. Shown is the DFV piston. 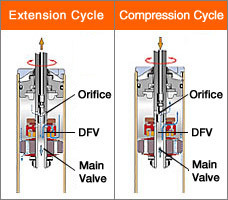 The unit has a sub-valve installed on both the compression and extension cycles. The compact design still enables full measurement of the stroke of the shock. With the use of 3 channels on both the compression and extension cycle sides, the control of the attenuation of the moment at the beginning of the shock stroke is possible. Before the main valve starts to move, the sub-valve releases oil pressure for an overall comfortable ride. To get the best feel of the DFV, a custom suspension for the CT9A were constructed. The front is the inverted type with steel casing and aluminum brackets. The rear is equipped with an aluminum casing that compliments the super light components that make up the rear suspension. 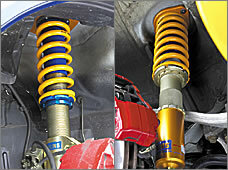 The springs were set at 10 kg/mm front, and 8 kg/mm rear with a 20 way adjustable shock. This adjusts the compression and extension cycle of the shock at the same time. "can throttle the vehicle even more because I feel secured to the ground"
My initial impression when I drove the car was that it might have been too soft, t as I entered a turn, the car swayed beautifully and helped turn smoothly. Rather than being soft, the vehicle tenaciously turned around the corners with ease. This shock processes info from various types of road surfaces and works with it very well. I can also tell how well the tires are gripping the road as well. I can throttle the vehicle even more because I feel secured to the ground. If the surfaces were wet, I think the true characteristics of these shocks would have been displayed. The comfort is unbelievable. There are absolutely no problems in using these shocks in both street and track. These are a must have for those who still sport stock tires that go to the race tracks once in a while. When using S tires with these, the springs may need to be a little stiffer, but those who have been using Neovas or RE01 class high grip radial tires, it may be suitable. With 20 different levels of adjustability, the ride characteristic can be changed frequently. These units are perfect for comfort, and spirited time attacks. One way to describe these shocks is that it does not give up the streetable comfort while still providing a sporty characteristic. It has been 6 years since we had invented the PCV system in the shocks. We also provide custom shocks to correspond to your needs. Feel the shocks that have been used in the Super Taikyu and Super GT races!